No more sleeps; this is the day! After a dismal start to the 2009 season, the Eels turned around just in time to scrape across the finish line. And by continuing their extraordinary run that would see them win 9 of their last 10 games, they went on to be the first team ever to make it to the Grand Final from 8th position on the ladder. So, in just a couple of hours, the Parra Eels will take on the Melbourne Storm to win their first Grand Final since 1986. 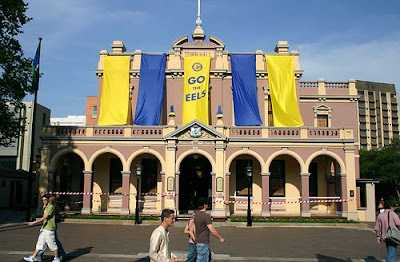 Disclaimer: The above picture is for illustration purposes only and does not depict today's actual decoration of Parramatta Town Hall. While I would love to post some images of a town that is well and truly engulfed in blue and gold; I am at the moment photographically impaired and must resort to a photo from the Columbo archives, taken a couple of years ago.